NOTE: It has been brought to our attention that some of the METRIC gear shifter pegs are smaller in diameter then 8 mm (5/16") and this in turn would cause the Shiftcush to rotate on the gear shifter pegs. 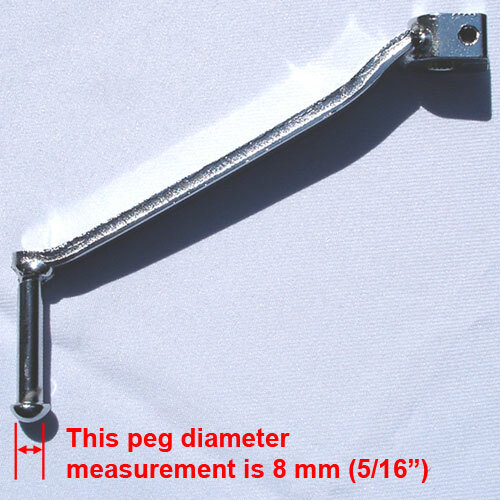 If your gear shifter peg diameter is smaller then the standard 8 mm (5/16") then it is recommended that BEFORE you install your Shiftcush you should first wrap several rounds of black electrical tape around the shifter peg (start your wraps at the end which is welded / connected to the shifter lever and work your way outwards). Then, install your Shiftcush. Now the Shiftcush will be nice and tight and there is no chance of it rotating on the shifter peg while riding.